Book titles, song lyrics, and movies have all relied on the imagery of the lagoon to draw people into a romantic and relaxing state of mind. By definition, a lagoon is a shallow body of water that is separated from a larger body of water by a low sand bank, barrier islands, or coral reefs. In warmer climates, lagoons tend to draw vacationers who enjoy the warm pools and calmness as compared to nearby oceans. Depending on your travel plans, there are many great options around the world for you to enjoy this type of relaxing vacation. Micronesia is the site of Chuuk or Truk lagoon, a surreal and beautiful location that offers scuba divers an opportunity to explore various shipwrecks. The ships are left from World War II, when the American navy attacked the Japanese fleet at Truk lagoon. It is estimated that there are over 30 naval ships and 250 aircrafts at the bottom of the waters. Because of this, the region is often considered to have the best wreck diving in the world. Beyond this historical significance, this lagoon offers beautiful surroundings filled with coral gardens and artificial reefs. Iceland’s Blue Lagoon offers another other-worldly vacation option. The water may look icy but can reach very warm temperatures, and the minerals in the water are rumored to have healing and restorative properties. Located in southwestern Iceland, this lagoon provides seclusion and relaxation. It is one of the most visited places in Iceland, providing tourists and locals the opportunity to appreciate its natural beauty and warm waters year round. For a more traditional lagoon atmosphere, you can visit the place where the movie “Blue Lagoon” was filmed. Fiji’s Nanuya Levu is situated between two sets of islands and provides a luxurious tropical paradise in the sun. For an extra dose of luxury, the entire island can be rented for private use. There is only one resort located on the island, allowing visitors the opportunity to relax and explore without feeling too crowded by other tourists. Laguna Colorada, also known as the Red Lagoon, is located within Bolivia’s Eduardo Avaroa Andean Fauna National Reserve. This fascinating shallow saltwater lagoon is red due to the sediments and pigmentation of some of the nearby algae. Beyond the brightly colored water and land, you can observe bright and interesting birds. Flamingos inhabit the area along with over 50 other species of birds, making for lively and colorful photographs. If you dream of a larger lagoon with every perk that a South Pacific island resort can offer, visit the Aitutaki Lagoon in the Cook Islands. This lagoon has a global reputation of being one of the most breathtaking and offers beautiful views, small islets, and stunning coral reefs. 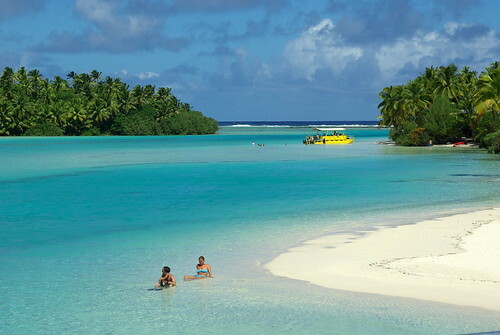 This region is one of the most popular destinations in the Cook Islands. The area also includes various small islands that border the lagoon, providing many options for relaxation, exploration, and sunshine. The coral reefs in the area provide ample colorful opportunity for divers to explore the local coast and marine life. Whether you are looking for spectacular natural views, beaches, and diving opportunities or just searching for a relaxing getaway, lagoons offer a special treat for any beach fans. These unique environments provide a more secluded feeling, allowing travelers to relax and make the most of the beautiful atmosphere.